My heart had been in pieces since the night Jamie had been killed. It had taken every day of the last five years for the pain in my chest to fade to a dull ache. Still, it was there. And after every one of my interactions with Cole, that ache flared. Because when I was with Cole, I wasn’t remembering Jamie. Cole made me forget the pain. 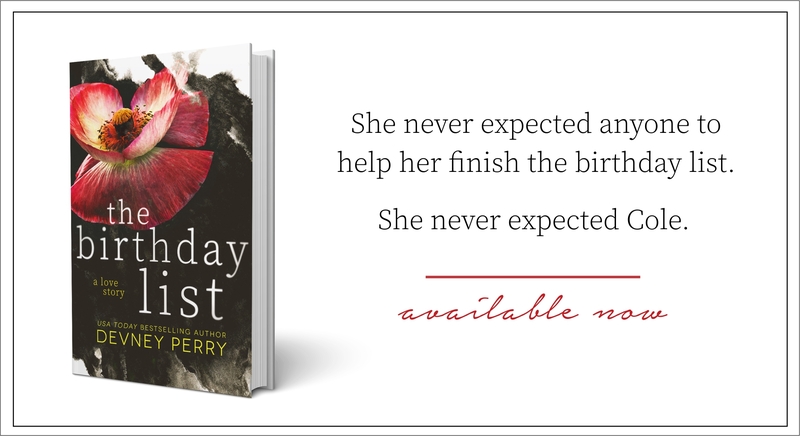 ”THE BIRTHDAY LIST” is my first read by the amazing Devney Perry and it will definitely not be my last. I’ve got yet another author to add to my ”Must Read” shelf. This story was simply INCREDIBLE!! It had a gripping plot, loveable Heroine, and one of the most amazing and swoon worthiest Heroes I’ve come across in a while. Cole Goodman is absolutely perfect, so much so, that I sighed quite often because let’s face it, there isn’t a man like him that exists outside the pages of this wonderful book! All I can say is that I see why there’s been so much love for this author’s previous works. If you haven’t tried anything by her yet, this would be a perfect one to start off with. Poppy Maysen was once married to her college sweetheart. They were deeply in love and unbelievably happy. But one tragic night before their first wedding anniversary, Jamie is killed during a senseless act of violence and life as Poppy knows it is never the same again. Five years have passed, and Poppy has not found a way to move on from her grief. She doesn’t know how to let go and deep down she’s afraid that if she did, she would be dishonoring Jamie’s memory. After so many of her loved ones encourage her to pick up the pieces of her life and start living again, she opens up a restaurant. This has been a lifelong dream and it’s one of the items listed on Jamie’s ”birthday list”. Before Jamie died, he put together a list of tasks he wanted to complete before each of his upcoming birthdays. Tasks like taking a karate class, buying a restaurant for Poppy, skydiving, etc. 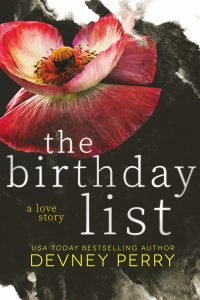 Poppy thinks that if she completes all of Jamie’s birthday list tasks that somehow it will give her closure and then she might be able to move on from the past. 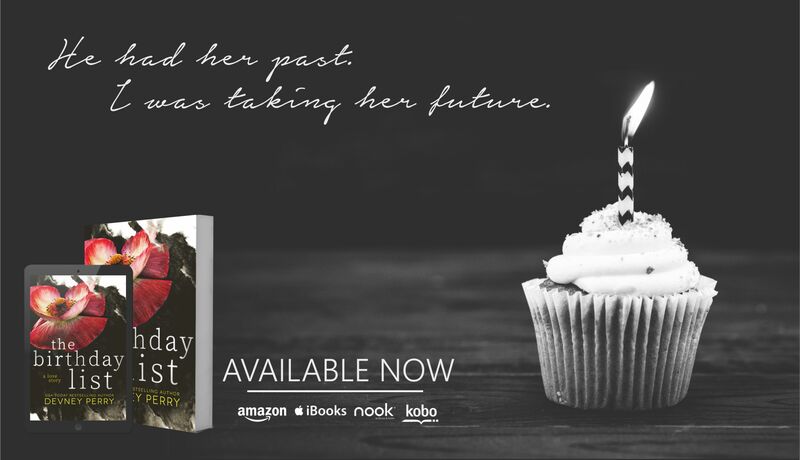 Early on in her journey to tackle Jamie’s list she runs into Cole Goodman, the police officer that delivered the heartbreaking news on her doorstep that changed her life forever. She can’t ignore the strong connection she feels towards him and it’s messing with her head. Cole recognizes Poppy the moment he lays eyes on her. He remembered how strong she was after getting the devastating news, and she hasn’t forgotten the warm and compassionate man who stayed by her side in her living room until her brother was able to come and take care of her. Cole is stunned by Poppy’s beauty and all he wants is to get a chance to be a part of her life. He senses right away that Poppy hasn’t been able to let go of her husband and that if there’s any chance for him to be in her life, he’s going to have to take things super slow and does he ever! Cole finds out about Poppy’s restaurant and conveniently shows up for lunch on a regular basis and the two form an easy friendship. He’s completely smitten with Poppy and deep down she is incredibly attracted to Cole but is so afraid to let him into her heart because she fears that she’ll end up forgetting about Jamie and what they once shared. Cole is a man on a mission. He wants Poppy more than anything and will take her any way he can get her, and so he offers to help complete all the tasks on Jamie’s birthday list. As they set out on this incredible journey together, Poppy’s heart is starting to beat again but now it’s for someone new, and yet she still finds it hard to let Jamie go. Will Poppy wake up and realize that true love can come in someone’s life more than once? Is Cole fighting impossible odds and how long will he truly wait on the sidelines for the woman who has stolen his heart? THE BIRTHDAY LIST is currently available and highly recommended!! !